A Molino teen had four top 10 finishes this weekend in the National Indoor Kart Championships in Batesville, Mississippi. Jarrett Parker, 15, finished eighth in the Junior 3 Heavy Feature kart race Friday with a time of 3:43.662, just 6.936 off first place. In the Junior 3 Animal Lite Feature, Parker finished tenth, with a time of 15:10.899, 3.125 off first place. In the Junior 3 Pro Feature, Parker was ninth, with a time of 7:09.350, 6.364 behind first place. In the Junior 3 Animal Feature, he was eighth, finishing 6.919 off first with a time of 5:43.825. In the Junior Pro 3 race Saturday night, he started in the rear in the 20th position, working his way up for a ninth place finish in the 2o-lap race. Parker, a Northview High School freshman, won the state championships in both Alabama and Mississippi this year. He has previously competed, either winning or placing, in races across Florida, Georgia, Mississippi and Alabama. 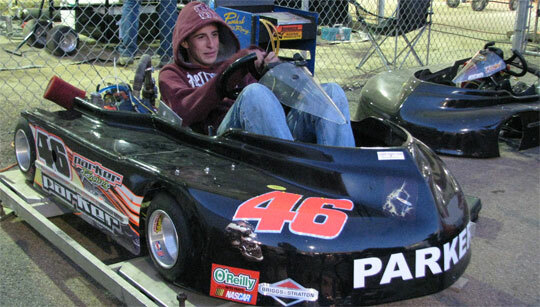 Jarrett, who has been Kart racing since 2003, is the son of Scott and Tammy Parker of Molino. 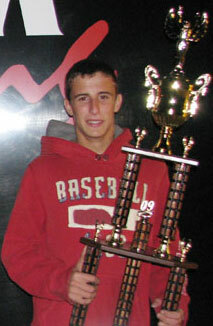 This weekend’s National Indoor Kart Championship will air on ESPN2 and The Outdoor Channel sometime in 2010. 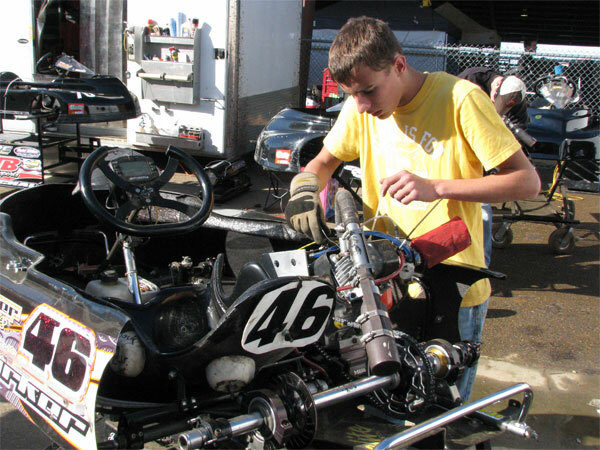 Pictured above: Molino teen Jarret Parker has made it big the in the world of kart racing. Pictured top inset: Parker after a big win. 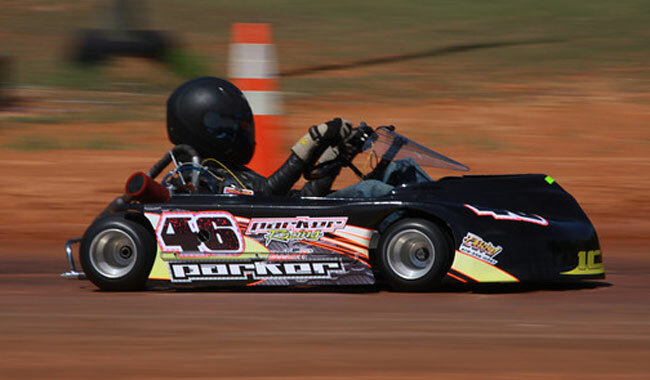 Pictured bottom inset and below: Parker at the National Indoor Kart Championship this weekend in Mississippi. Submitted photos for NorthEscambia.com, click to enlarge. Work is set to begin this week on a $5 million resurfacing project on Highway 97 from Molino to Alabama that will take about 10 months to complete. The entire 22.5 mile length of Highway 97 will be repaved from County Road 95 in Molino across Highway 29 to the Alabama state line. No major drainage changes are expected to the route’s 55 cross drains under the highway, with the exception of some possible changes near the intersection of Highway 97 and Crabtree Church Road. There will also be new and replacement guardrails installed along the state highway. Once work begins on the actual highway, work crews will restrict traffic to one lane through the work zone. Weather permitting, the project should be completed in September 2010. “They will maintain accesses to businesses and residences during the process,” she Branton said. Existing 12 foot wide travel lanes and five foot paved shoulders will be milled and resurfaced. This project does not include the four-laning of Highway 97. A four lane highway is not in any of the state’s current plans for Highway 97. NorthEscambia.com will work with the Florida Department of Transportation and the contractor to keep you updated on the status of the project. Pictured above: Highway 97 (running left to right in the photo) in Walnut Hill. NorthEscambia.com file photo, click to enlarge. Trial has been delayed again for a Bratt man charged with allegedly abusing two girls — one just five years old. 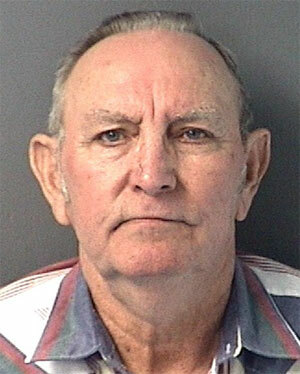 Jody Posey, 71, of 7100 North Pine Barren Road, was arrested in early March by the Escambia County Sheriff’s Department and charged with three felony child sexual abuse charges. His trail was scheduled to begin today in front of an Escambia County Circuit Court jury, but was delayed due to Hurricane Ida. He had been scheduled to appear on November 10 for a plea hearing prior to trial, but court cases on that date were all rescheduled due to Ida. Posey is now scheduled to appear in court January 12 for a plea hearing, and his jury trial is set for February 1. Posey has pleaded not guilty to all charges. He was originally held without bond, but Circuit Judge Michael Allen approved a bond reduction request in the case. Posey remains free on $200,000 bond. If you want advertise on NorthEscambia.com, we’ve got some good news for you. We are having a “Cyber Monday” sale on advertising, giving business owners and managers the opportunity to save 33% on our new advertising packages. We are opening up many more advertising slots on the area’s most popular local news source, and they are discounted for any business that inquires about advertising during the NorthEscambia.com Cyber Monday sale. If you are interested in advertising on NorthEscambia.com, make sure you send an email to news@northescambia.com or use our contact form by midnight tonight during our “Cyber Monday” sale. You must include your name, the name of your business, a valid email address and a contact phone number. Contacting us about advertising does not obligate you to make any purchase. We will send you an email late in the day on Monday with all of the advertising details. You will have up until December 4 to decide to make your investment in advertising here on NorthEscambia.com. Cyber Monday is the term that refers to the Monday following Black Friday. Most online retailers hold a Cyber Monday sale; it is traditionally the busiest day of the year for online retailers. Advertising opportunities are limited, so respond early. Some restrictions apply. If you responded to our Black Friday sale, there’s no need to respond to this offer; it is the same savings opportunity. A series of cold fronts will mean increasing colder days and nights in the coming days, as well as rain. Some of the rain might be heavy by Tuesday and Tuesday, possibly dropping two or three inches in some areas. By Thursday, north winds will usher in several days of temperatures in the 60’s and overnight lows in the 20’s and 30’s. Today: Periods of showers and possibly a thunderstorm. High near 68. North wind between 5 and 10 mph. Chance of precipitation is 80%. Tonight: Mostly cloudy, with a low around 39. North wind between 5 and 10 mph. Tuesday: A 50 percent chance of showers after noon. Mostly cloudy, with a high near 57. East wind between 5 and 10 mph. Tuesday Night: Showers and possibly a thunderstorm. Some of the storms could be severe. Low around 53. Breezy, with a east wind between 10 and 20 mph, with gusts as high as 25 mph. Chance of precipitation is 100%. Wednesday: Showers and possibly a thunderstorm before 2pm, then showers likely. High near 66. Breezy, with a east wind 15 to 20 mph becoming west. Winds could gust as high as 30 mph. Chance of precipitation is 80%. Wednesday Night: A 50 percent chance of rain. Mostly cloudy, with a low around 42. Breezy, with a west wind between 15 and 20 mph, with gusts as high as 25 mph. Thursday: Mostly cloudy, with a high near 56. Northwest wind between 10 and 15 mph. Thursday Night: Partly cloudy, with a low around 28. West wind between 5 and 10 mph becoming calm. Friday: Sunny, with a high near 52. North wind between 5 and 15 mph. Friday Night: Clear, with a low around 25. Saturday: Sunny, with a high near 59. Saturday Night: A 20 percent chance of showers. Partly cloudy, with a low around 44. Sunday: A 30 percent chance of showers. Mostly cloudy, with a high near 65. Escambia County Students of the Month for November have been named by the Escambia Association for Administrators in Education. The awards are presented monthly to two students from participating schools. Bratt Elementary: Aiden S. Broadhead, PK; Ta’keyzha D. Johnson, fourth grade. Jim Allen Elementary: Deontrey A. Brown, third grade; Kayla A. Doten, third grade. Molino Park Elementary: Meredith F. Morgan, third grade; Leonard R. Solano, third grade. Ernest Ward Middle: Timothy M. Born, eighth grade; Jensyn L. Warner, sixth grade. Ransom Middle: Lauren A. Spencer, seventh grade; Chandler W. Cotton, seventh grade. Northview High: David A. Lambert, 11th grade; Holly N. Dickson, 10th grade. Tate High: Leslie A. Godwin, 12th grade; Dalton S. Campbell, 10th grade. Pictured top: David Lambert and Holly Dickson, Northview High School’s Students of the Month for November. Submitted photo for NorthEscambia.com, click to enlarge. 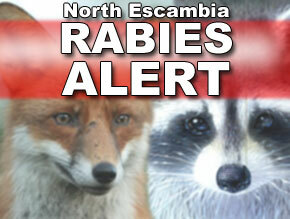 A three month rabies alert is still underway in North Escambia, with several residents faced with a series of rabies shots after being bit or scratched by a rabid or possibly rabid animal. We spoke to one Walnut Hill family with a child that was forced to endure the rabies shots last year after their then four-year old was bitten by a bat. 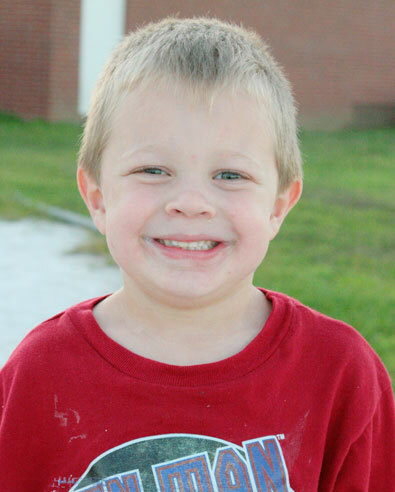 Luke Bridges, 5, underwent the series of rabies shots during the summer of 2008. Luke walked up on the family’s porch in Walnut Hill where he was bitten by a brown bat, according to his mother Somer Bridges. “To him, it was not that serious,” Bridges said. “He thought he was going to be Bat Boy just like on Scooby Doo.” But it was different for Somer and her husband Ted. The family went to the Sacred Heart Hospital emergency room. Over the next few weeks, Luke received the rabies shots under the supervision of the Escambia County Health Department. While Luke suffered no ill side effects from the bat bite or rabies shots, Bridges said, it was a trying time that she would not want any family to endure. “I would not wish this on any parent or child,” she said. The original North Escambia rabies alert this year was issued at the end of August after one person was bit by a rabid fox and two raccoons that bit dogs tested positive for rabies. Then three more rabid animals were found in North Escambia, prompting the health department to extend the rabies alert until November 29. The alert has since been extended until January 26, 2010. The Escambia County Health Department received laboratory-confirmation of rabies in a skunk and two raccoons. The skunk and raccoons were sent for testing after interacting with pets and, in one case, a pet owner. These positive tests are in addition to the rabid animals that prompted the August alert. Then in late October, six more people — including at least one animal control worker — were exposed to rabies following an incident with a rabid cat in the McDavid area. The Escambia County Health Department confirmed the incident occurred, but they would not confirm the location of the incident, citing concerns that identifying the community would violate health privacy laws. But NorthEscambia.com learned the incident occurred near McDavid. According to a source familiar with the incident, a woman was bitten outside her home. She retreated inside her house and called for help from a neighbor because she feared going back outdoors where the cat remained. We are told that four or five people total were bitten or scratched by the animal. Some those attacked by the cat were attempting to trap the cat. Health department officials would confirm that an animal control worker called to the scene was also “exposed” to rabies. 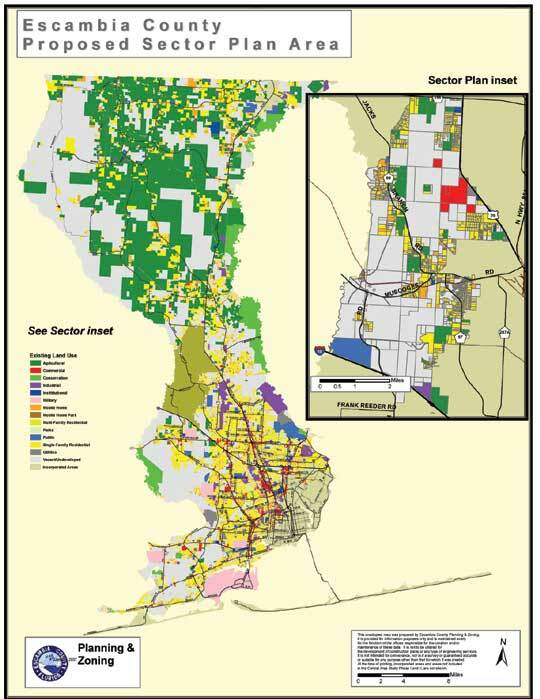 If you want to help to plan the growth of a portion of the North Escambia area, there’s a meeting Monday night for you. The Escambia County Long Range Planning Division will hold an Optional Sector Plan meeting Monday from 1:00 to 2:30 p.m. at the Escambia County Building Inspections Conference Room at 3300 N. Pace Blvd., Suite 300. The Optional Sector Plan encompasses approximately 15,000 acres of land north of Interstate 10, south of Barrineau Park Road and west of Highway 29. It is a long-term conceptual planning project that will incorporate road networks, schools, parks, and commercial and residential projects. Representatives will be on hand to discuss any issues, answer questions, and receive ideas for creating a unified sector plan. For more information, visit the Planning and Zoning web pages at www.myescambia.com or contact Eva Peterson, project manager at (850) 595-3475. Hudson W. Woodfin, Jr., of Barrineau Park has been appointed to the Escambia County Marine Advisory Committee by the county commission. District 5 Commissioner Kevin White recently solicited nominees for the position to the committee, which advises the commission on marine related issues in the county. Woodfin holds a B.S. degree from the University of West Florida in Industrial Technology/Mechanical Engineering and an A.S. degree from Pensacola Junior College in Civil Engineering Technology. He is currently employed by Ascend Performance Materials as a Optimization Planner. 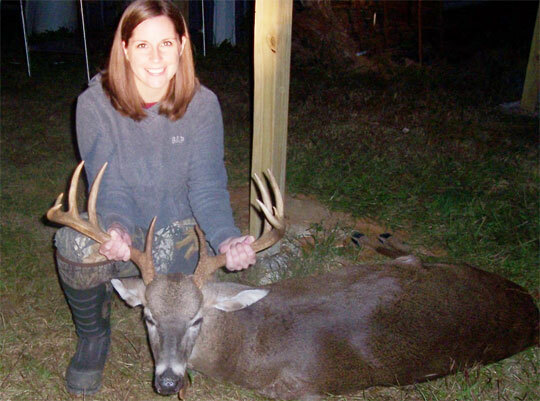 Melissa Hogan, 29, shot her first buck Saturday at the Black Water Hunting Club at Barnett Crossroads in Escambia County, Ala. Hogan’s buck was 10 point, 209 pounds with a 21 3/4 inch wide spread. Submitted photo for NorthEscambia.com, click to enlarge.